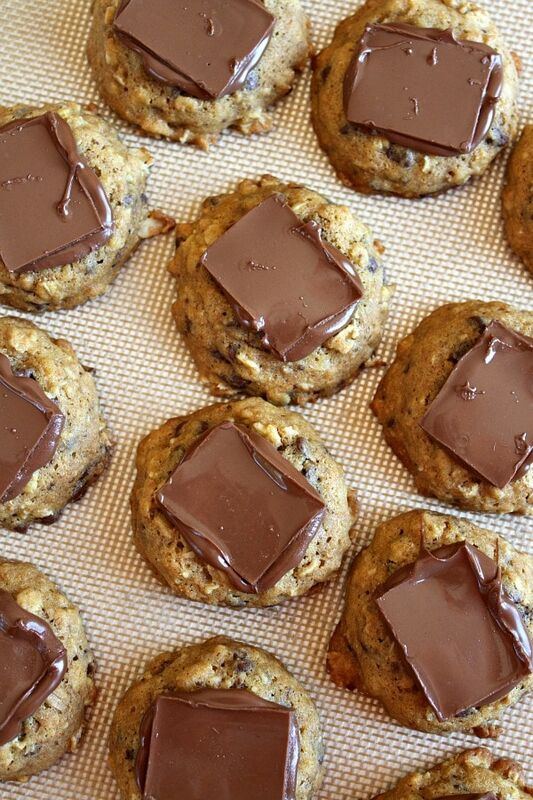 As soon as these babies come out of the oven, they are topped with with a chocolate bar. Those chocolate bars will immediately take on the heat of the cookies and begin to melt into wonderful chocolate puddles. 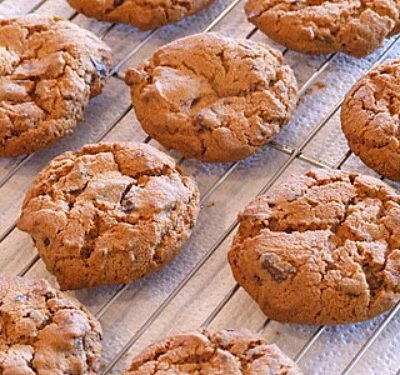 Slide them onto a cooling rack to cool completely. Can I call them healthy since I incorporated some Gold Medal Whole Wheat Flour into the recipe? I think so. 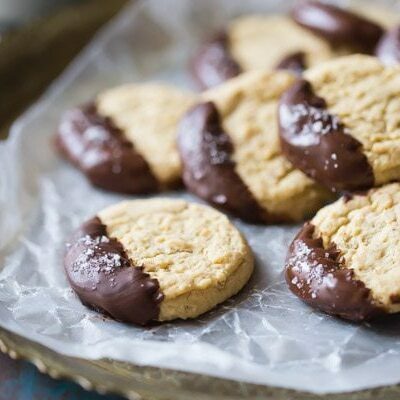 The chocolate forms a frosting-like layer on top of the cookie, especially while they’re warm. Picture yourself eating a warm cookie with a melted mass of chocolate on top. That’s a very pretty picture, isn’t it? 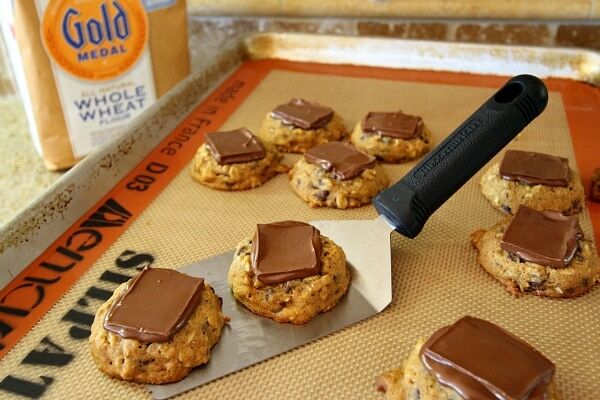 Once cooled, you’ve got a built-in chocolate bar on top of your cookie, creating the advantage of eating a cookie and a chocolate bar all in one dessert. 1. 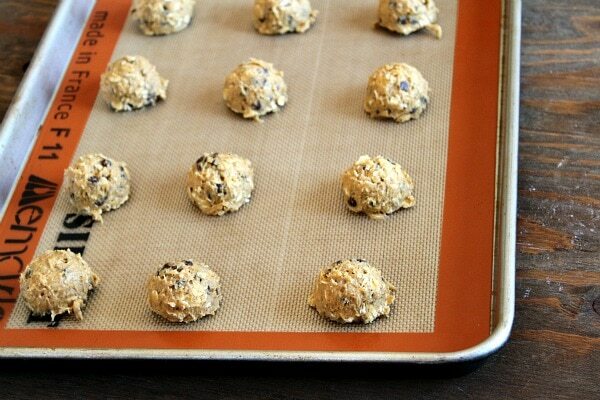 Preheat the oven to 375 degrees F. Line baking sheets with parchment paper or silpat mats. 2. In a medium bowl, whisk together the flours, salt, baking soda and spice. 3. In a large bowl, use an electric mixer to combine the butter and sugar. Mix on medium speed until light and fluffy. Reduce the speed to low and add the egg and vanilla. Mix in the pumpkin puree. Add the flour mixture and mix until it is incorporated. 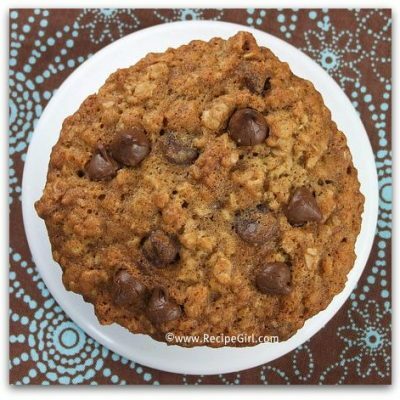 Set aside the mixer and stir in the oats and chocolate chips. 4. 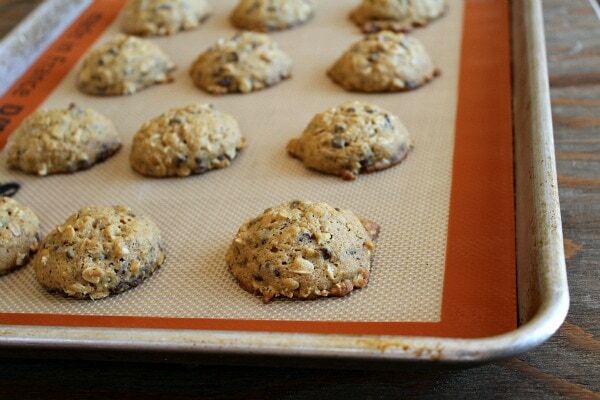 Use a cookie scoop (or drop by heaping tablespoonfuls) to scoop onto the prepared baking sheets. Space the cookies about 2 inches apart (12 on a sheet should work perfectly). Bake 9 to 11 minutes, or until the cookies are set and golden brown. 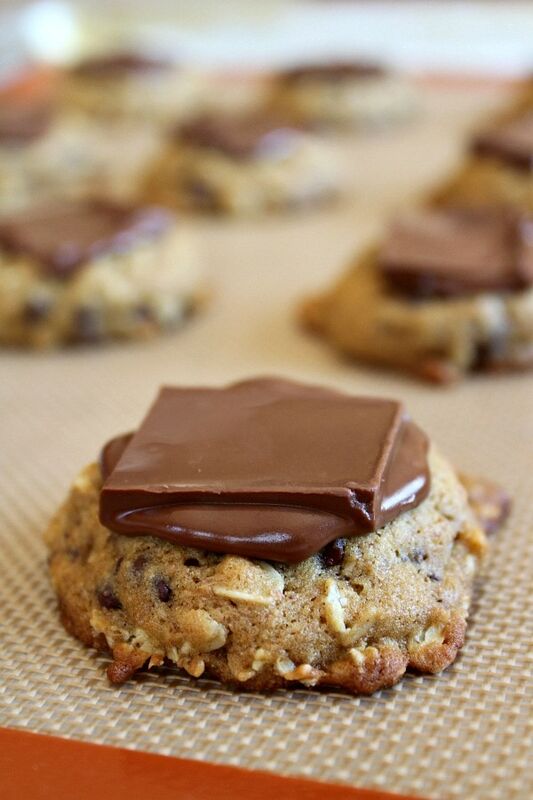 Remove the baking sheets from the oven and immediately place a candy bar on top of each cookie. Let them cool for about 10 minutes on the baking sheets, then remove them to a wire rack to cool completely. The cookies are especially good warm... with all of that melted chocolate swimming around on top, but if you need to store them, let the chocolate set on the cookies before storing in a covered container. *Fun twist: Make them Pumpkin- Oatmeal S'Mores Cookies by adding a few marshmallows after the chocolate has had a chance to melt (or a sprinkle of some of those super miniature marshmallows that they sell these days). Disclosure: I’m working with Gold Medal Flour to create seasonal recipes for the next few months. This is one of those goodies. All opinions shared are my own. That melted chocolate looks too good for words! What a fab cookie. Poor little dude for dealing with all the braces! 10 years of orthodontia for me was more than enough, and I went Cray-Cray when they came off! And hopefully he won’t have to keep them too long and can get back to his candy devouring in style! These cookies – legit style. I’ll take 43 please! This is so genius. I love that melted chocolate bar on top! So droolworthy! This is a great combo. Love that you added pumpkin. I’m praying the snow keeps falling and I’m off work tomorrow… these MUST be made!!! Oh, just look at all that melting chocolaty goodness! Oh my – I almost licked the screen! Yum! I can’t possibly explain how badly I want these right now. OMG! I know I don’t read every blog everywhere, but I am baffled that it’s nearly 20123 and this post is the first time I’ve seen that done! Awww your lil guy is so generous that he’s willing to share his candies. That’s very sweet of him and this cookies look so ah-ma-zing! Pumpkin and chocolate always go well! Love it! Oh, these cookies look so rich and irresistible! I love the pumpkin + chocolate combo! 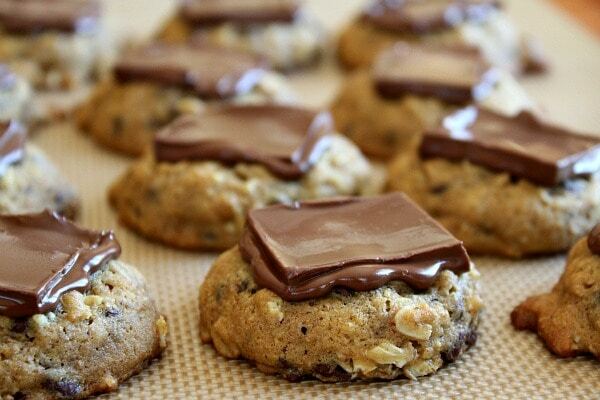 genius idea with the chocolate bars as frosting – and they look so cute! 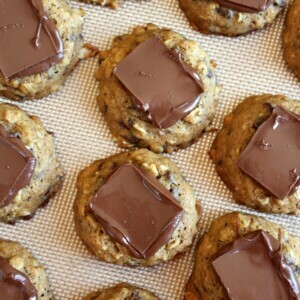 I love the idea of “instant frosting” I bet the chocolate goes perfectly with these cookies! 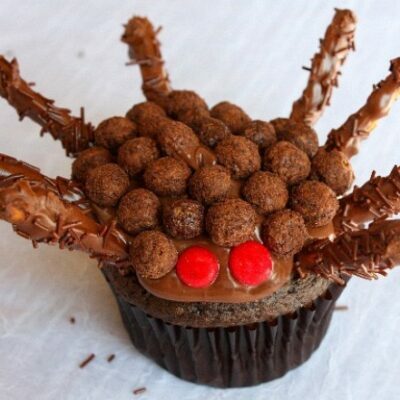 Oh my gosh Lori, I love that you just stuck a candy bar on top of these. Such a little thing that I imagine has a huge taste impact! Gorgeous!